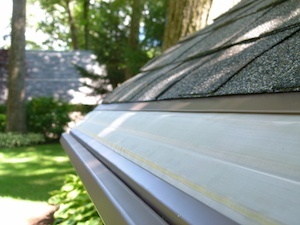 Quality gutter guards should keep debris from piling up and easily make your gutters clog free. Clogged gutters are the last thing our clients want to deal with. Not only does cleaning gutters require time and energy, cleaning can also be dangerous especially on some of the taller homes in Atlanta Metro. It can also seem like cleaning only works for a moment before local flora builds up on your gutters again. At MasterShield ATL we understand all this. That's why we are exclusive dealers of MasterShield gutter guards. This award-winning technology is patent-protected and has been installed in thousands of homes. Local and national organizations like Ask the Builder and Extreme Makeover: Home Edition have also chosen MasterShield gutter guards as their preferred option for gutter protection. If you take care of your gutters now, you'll thank yourself later. Get a free quote from MasterShield ATL today in Georgia! MasterShield® is pitched or sloped like your roof, so debris can actually shed. Other gutter guards sit too flat and just create a shelf where debris sits and clogs the filter. Start with a free estimate for your MasterShield gutter guard installation! Make sure that gutter cleaning becomes a thing of the past with quality MasterShield gutter guards from MasterShield ATL. Don't be fooled by imitators or cheap, ineffective gutter protection products. Keep debris out of your gutters with the gutter protection system that's widely trusted by experts nationwide. As your local, family-owned contractor with years of experience providing exceptional service, you can count on us to make your gutter guard installation a success. At MasterShield ATL we focus on quality products, first-class installation, and getting the job done right the first time. Call us at 1-844-822-2454 or contact us online to schedule a free estimate! We serve customers in Woodstock, Atlanta, Roswell, Marietta, Smyrna, Alpharetta, Athens, Kennesaw, Duluth, Decatur, and throughout the surrounding cities and towns.